This is the EMD SD80MAC CSX Dark Future diesel locomotive from Kato. The SD80MAC series was introduced by EMD in late 1995. Conrail was the first railroad to receive the SD80MAC in early 1996, and as it would turn out, Conrail would be the only original buyer of this locomotive, even purchasing both of the demonstrator units. CSX and Norfolk Southern have since acquired these units. 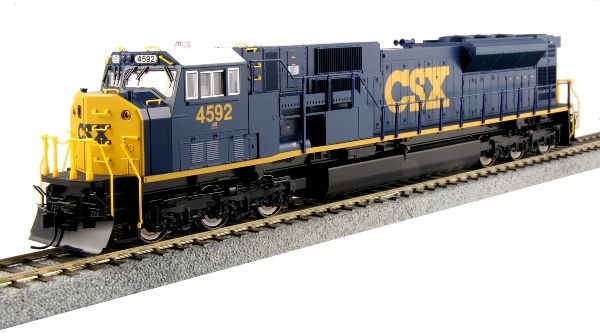 Today, many of these locomotives are still in service with CSX, having acquired the modern and striking “Dark Future” paint scheme that all new CSX locomotives now wear.